Prayer is necessary to the Christian life. One may say that it is a part of the lifeblood to abiding in Christ. For how can you develop a relationship with a person, the Person (specifically our Lord), without true and open communication with Him. So then, prayer is a two-way street with our God. But He is not just a friend, neighbor, or family member; He is our Creator, our Lord, our Sustainer, our Savior, therefore, we should be more attentive to what He is sharing with us of His Will for our lives. Listening to and for God’s Voice is an imperative to knowing His Will and acting upon the knowledge received in a manner that is pleasing in His sight. Praying to God is a part of our piety made all the more beautiful by seeing our Lord praying (as an example for us) while He walked on earth (see Matthew 26:36-46 / Luke 11:1-13). It worries me though that some may think of using prayer as a means to an end, instead of having a robust view of all that may happen with prayer and what prayer is truly about. Prayer should not just be the Christian telling God all that they want and need and desire, but allowing God to tell the Christian all that He wants and needs and desires and, ultimately, has for them. Too many times, people say that they will pray for someone or for a particular issue as kind of a nonchalant response to a tragic event or an unfortunate tribulation that someone they know is experiencing. I have always wondered how many people mean it when they say, “I will pray for you!” It has become such an issue for me that I will put down a reminder for myself to specifically pray for that person or that issue because I believe prayer works for one and I do not want to just say that I will pray for someone without actually doing it. 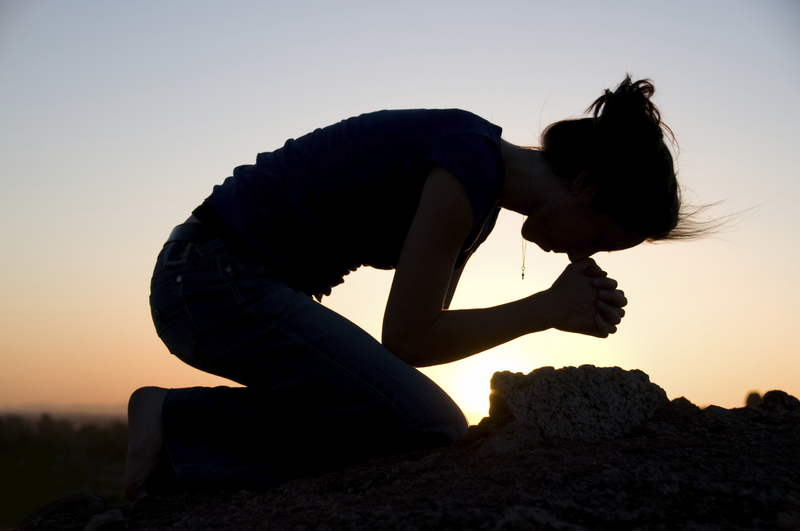 The act of getting on our knees humbly before our God is not just some cliché thing for many Christian people (and people of other religions as well). I imagine that many people would not even take the time to pray before a meal or to show solidarity with a fellow brother or sister who may be coming up against a major trial in their life. Outside of a supernatural context, where the Christian believes that we are connecting with our maker, prayer (in a “natural” sense) may help in some cathartic fashion. The simple gestures of bowing one’s head and closing his/her eyes and focusing on the issue at hand, be it good or bad, has a way of bringing one of bringing one into a peaceful place to a path of healing or just some reflection. Recently, there was some hoopla back in December of 2015 over the front page of a newspaper called the New York Daily News dealing with statements (dealing with prayer) from different GOP presidential candidates trying to show respect to a tragic event in San Bernardino, California. On the front page of the paper were these words: “God Isn’t Fixing This!” Now, most people would know right away that this is just a ploy or a tactic of sorts used by the paper and its “journalist” to get people to read the paper and give their liberal commentary on the conservative candidates making statements but showing little action on planning to stop the kind of violence that took place in San Bernardino. Of course, what was interesting is that they did not show the same kind of vitriolic and biased attack on the presidential candidates of the Democratic party. The GOP candidates made these statements through a social media website called Twitter. I am not sure if the Daily News knows this, but you cannot give much of a plan dealing with a social issue through 140 characters in a post called a “tweet“. Another issue is: how does this newspaper know what God is doing? Do they have some sort of supernatural and metaphysical means to know His plan? Or maybe they pray as much as the conservatives that they are writing about and God has given them the authority to speak for him? If that is the case, then maybe they would like to show us like Elijah going against four hundred and fifty prophets of Baal and the four hundred prophets of Asherah (1 Kings 18) and enlighten us to what God has next for the country. But what they did point out in a small way was that too many people have said that they were going to pray about something or that something would change, while they showed little action on making that change. They prayed to God and still prepared for a fight. They hoped in the Lord to keep them from harm, while preparing to me danger head-on. This reminds me of our Savior as He prays in the garden of Gethsemane in Matthew 26. Jesus asks God the Father to take the pain and anguish away, but He (knowing that the Cross was His destination) said that the Father’s Will is to be done. Jesus and Nehemiah and the people of Israel give examples that prayer should be our priority, but action should not be placed aside, nor do you have to wait to act (every time), even if that means we are to face something that may cause us pain, even physical pain. However, action should be predicated upon rational planning and wise counsel with premature reflection on possible outcomes of said action. Was prayer ever meant to be a means to an end? Was it ever meant to be done alone without any action? PRAYER IS THE WAY WE COMMUNICATE WITH GOD BECAUSE OF FAITH IN HIM! BUT JAMES SAYS I WILL SHOW YOU MY FAITH BY MY WORKS!